A retired firehouse captain, Dan Corder, has embarked on a second career of building pirate ships at his Northern Neck home. Arrrr mateys! If you be looking for a new vessel, Captain Dan is your man. Dan Corder, a retired fire station captain and self-described “extreme pirate ship maker,” earns a living building ships for backyard playgrounds and sailing. One of his creations was featured on Home and Garden Television and another is setting sail in Key Largo, Florida, to give tour groups a seafaring experience. The Northern Neck resident’s latest creation, the Brown Pearl, was recently posted for sale on Craigslist. The post says to “parlay” with “Capt. 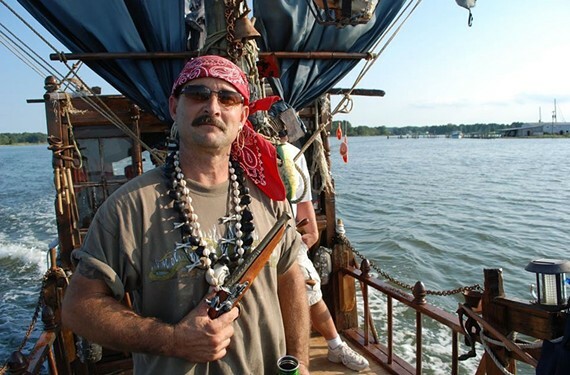 Dan” to purchase the 26-foot sailboat turned pirate ship for $5,500. She’s equipped with three cannons, rigged to shoot oranges, and makes a live-action firing sound. Corder has received inquiries from as far away as Jamaica for the ship he calls the Brown Pearl. For Richmonders who want to try their sea legs, Corder says that he’s willing to deliver the boat to a buyer who comes out to take a look. The whimsical 57-year-old started crafting the boats when he retired from a Loudon County fire station after 34 years. He uses older recreational boats and searches thrift stores for items such as wood planters to make crows nests, and old window frames for portholes. His creations caught the eye of an executive producer for Disney who asked Corder to build a ship for the Galloway family for the Home and Garden Television channel show, “My Yard Goes Disney.” At first, Corder thought some of his old firehouse buddies were playing a prank. Instead, he was soon lugging a boat to Ohio for the episode. Corder loves living life on the water in the Northern Neck town of Callao. He says that he re-purposes boats so people can see that sailing can be an affordable recreation. “We’re so spoiled in the United States by wanting something new and shiny and pretty,” Corder says.